Reform Creative was tasked to produce a client pack, which was to be mailed out as a welcome to new clients for hosting organisation Melbourne. The pack was to reflect the personality of the business, include an introduction to the team and the range of services. It was important that it was not construed as a ‘hard sell’ of additional services. 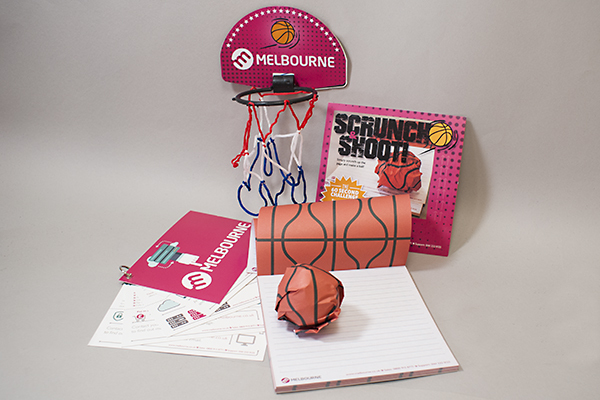 Reform suggested that a gift should be included within the pack that would reflect the personality of Melbourne, stays with the client and reinforces the brand. The target audience of this brief was mainly the creative sector located around the Greater Manchester area and predominantly male with an age range 25-40 years. The long-term aim is to grow the customer base by widening the geographic reach across the North West. The purpose of the pack was to ensure the new client felt good about their decision to engage with Melbourne. To experience a good customer service from a team which they can put faces to names, pick up the phone to and be confident in the knowledge that problems/issues will be dealt with by individuals who are familiar with their business. Build trust and confidence and ultimately (long term) cross sell additional products. Reform focused on gift ideas that the recipient would most likely place on their desk and interact with. A gift that will be retained and therefore be a permanent reminder of Melbourne with a contact number always in view. Reform produced a variety of elements to include in the pack. One of which was a ‘scrunch’ pad. This is a fun item with a basketball printed on one side of the paper and the other side clear for notes. The branding was printed on the plain side of each sheet. Scrunch the sheet and it forms a ball. The pad would sit on the desk with a mini basket (hoop). The pack also consists of a set of cards with a rivet in one corner. The cards are brightly coloured and contain summary information about the other services and a call to action to visit the website and find out more.